Windows Store also known as Microsoft store makes it easy to install, manage, and uninstall apps with just a single click in Windows 10. Most of all, the Windows store app manages all the updates in the background so that you don't have to manually update the applications one by one or have to deal with the update notifications as soon as you open your favorite app. Of course, the Windows store still doesn't have many popular apps. But that will change with the time, hopefully. That being said, there are some really good apps in the Store, both built for UWP and ported desktop apps. Here are some of the best Windows 10 store apps I found in my daily usage, give them a try. As good as it is, Windows store can stop working under certain circumstances. Often times, the store app won't open or respond. Even if the store opens you won't be able to install apps from it. There may be any number of reasons like system crashes, corruption, misconfiguration, etc., for this misbehavior. No matter what the reason is, to fix the issue, all you have to do is reinstall Windows store. This also helps when you uninstall Windows store app. Often times, reinstalling Windows 10 store reduces the troubleshooting steps and saves you a bunch of time too. Here's how to do it. There are two ways to reinstall Windows store, I will show both of them. The first one is to use the Settings app. The method is beginner friendly and can be done with just a few clicks. The second method requires you to execute a simple one-line PowerShell command. This method is useful if you cannot use the first method or for power users who don't mind using PowerShell commands. Since both methods work pretty much the same, follow the method you are comfortable with. Windows 10 provides an easy way to reset or reinstall Windows store directly from the Settings app. The best thing about this method is that you don't have to mess with the Command Prompt or PowerShell. Moreover, you can reinstall almost any Store app using this method. 1. First, open Settings app by pressing the keyboard shortcut Win + I. Alternatively, you can also open the Settings app either by searching for it in the Start Menu or by click on the "Settings" button in the Notification area. 2. In the Settings app, go to "Apps -> Apps and Features". On the right-hand side panel, find the Microsoft Store app and click on it. You will see additional options. Here, click on the "Advanced Options" link. 3. In the advanced options window, scroll down and click on the "Reset" button. 4. The settings page will prompt for confirmation. Click on the "Reset" button again. 5. 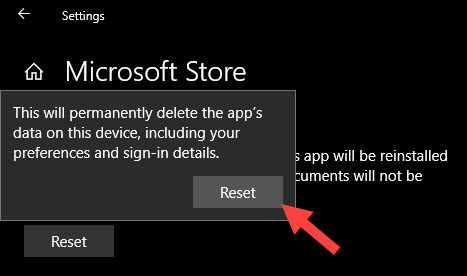 As soon as you click on the reset button, Windows will try to reinstall the store app. It can take a couple of minutes to complete the process. 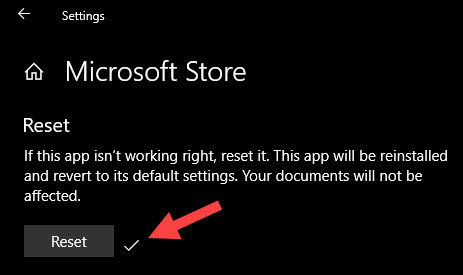 Once the Windows store is successfully reinstalled, you will see a small checkmark next to the "Reset" button. If for some reason the above method did not work for you or if you just want to mess with the command line, you can actually reinstall Windows store app using PowerShell. All you have to do is execute a single line of command. 1. To reinstall or reset the store app using PowerShell you need administrative privileges. So, search for "PowerShell" in the start menu, right-click on it and select the option "Run as Administrator"
2. In the PowerShell window, copy the below command, paste it and press Enter key to execute the command. To paste the command, right-click in the PowerShell window. 3. As soon as you execute the command PowerShell will initiate the process and reinstalls Windows store app within a couple of minutes. That's it. You are done reinstalling the store app on Windows 10. Now, you might be wondering what the above command actually is and what it does. It is quite simple actually. We are first getting the Microsoft Store package using the Get-AppxPackage applet. Then we are piping it to Add-AppxPackage which in turn reinstalls Windows store app in Windows 10 for all users. It is that simple. Hope that helps. Comment below sharing your thoughts and experiences about using the above methods to reinstall Windows store app. 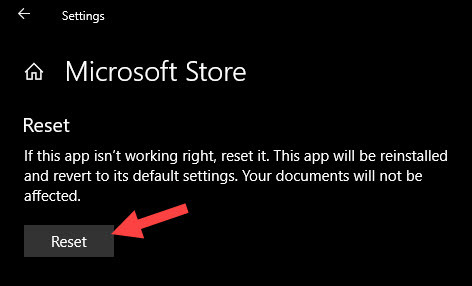 Also, let me know if you face any problem with reinstalling the Microsoft Store app. I will try to help as much as possible. Below some other helpful articles to fix different issues in Windows 10. Antimalware service executable high CPU usage issue. 0x80244018 error in Windows store. Start menu issues in Windows 10. Master boot record errors in Windows 10. Windows and Linux showing different time when dual booting issue.